MultitrackStudio features a touchscreen mode which makes the program easy to use with tablets, convertible notebooks and touchscreen monitors. You can interact with the knobs you see on the screen directly without having to find your mouse and move it to the right location first. MultitrackStudio will propose touchscreen mode if a touchscreen is detected. If it doesn't you can go to the Studio menu's Preferences window and select Touchscreen in the Input Device box. A 'Test Touchscreen...' button appears which lets you do a quick test. MultitrackStudio learns from this test whether it can distinguish between mouse movements and touch movements. Using the mouse in touchscreen mode will be a bit awkward if it can't, because mouse movements will be treated as touch. In touchscreen mode some controls are bigger to make them easier to use. The transport buttons are an example of this. Controls that don't get bigger still respond to a larger area to make them easier to use with touch. Touch screens are hard to use if controls are too small. Traditionally Windows runs at 96 DPI (DPI = dots per inch). Modern notebook screens can have 150 DPI or more, which makes everything significantly smaller unless you adjust the Windows DPI value accordingly. A MultitrackStudio track measures 9.5 mm in height if the Windows DPI value matches the screen's. It is highly recommended to make sure tracks aren't any smaller than this. You can increase the DPI value even more if you still can't use the touchscreen comfortably. If you'd rather not change the Windows DPI setting you can go to the Studio menu's Preferences window and use the Size setting to scale MultitrackStudio independently from the Windows DPI setting. It's highly recommended to use full screen mode. 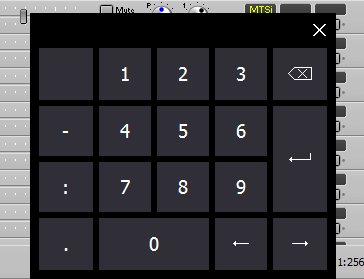 The knobs at the top and the bottom bar are much easier to operate this way, and you avoid the risk of touching the 'X' button or Windows task bar inadvertently. There's a button in the bottom-right corner of the main window to enter/leave full screen mode. Put a finger on the fader and move it horizontally. The fader thumb doesn't move as fast as your finger does, so you can control it accurately. Tapping the left half moves it down one step, tapping the right half moves it up one step. Put a finger on the knob and either move it horizontally or make a rotating movement below the knob. Put a finger on the button/box itself and move it horizontally. After moving about half a centimeter a white area becomes visible, representing the menu which will appear when you take your finger off the screen. Put a finger on the button and move it approx. 2 centimeters up or down to increase/decrease the value. If you keep the finger on the screen the button will continue to increase/decrease automatically. An onscreen keyboard appears if you tap a text box. Use the keyboard's Enter key to accept the new value, or close the keyboard to cancel. The whole slot area can be touched, ie. the little display also works, not just the button. Press-and-hold can be used to pop up the effect/instrument selector of a non-empty slot (keep the finger down for about a second). To move a slot it should be moved horizontally at first, even if you want to move it vertically. Even though the markers appear at the bottom you can (and should) touch them as if they span the full height. The Transport Options menu can be used to add markers. You can use it to delete markers as well (tap the marker before opening the menu). You can pull down a marker to pop up a menu with rename options, among others (see the "Buttons/boxes with right arrows" paragraph above). It's not possible to change the transport position while recording, in order to avoid doing that accidentally. You can move your finger horizontally over the transport position indicator. Moving to the left rewinds fully, moving to the right once takes you back to where the transport last started. Swipe left over start/stop button to rewind. Also stops transport if it's running. Put a finger on the contents and move it up or down, no need to use the scrollbar. Text in Comments window and Chords/Lyrics editors. An onscreen touch keyboard appears if you tap the text box. If there's a vertical scrollbar you can put a finger on the text itself and move it up or down, there's no need to use the scrollbar. Text can be selected by moving your finger horizontally. Once it's clear you're selecting rather than scrolling you can move vertically as well. With a multi-touch screen you can use two-finger zoom in/out gestures to make the text larger/smaller. 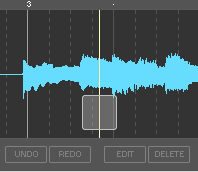 To move a single section, put a finger on a tracks' file name box (or the corresponding area on an Effect Return etc.) and move it a couple of centimeters horizontally before moving vertically. Moving up or down immediately will scroll all mixer sections. A message box pops up on tapping a file, and you can choose whether you want to open it in the current track or in a new one. The mode buttons in the bottom-left corner of an editor aren't available. A selector appears on touching an editor for about half a second (you can set this delay time in the Preferences window). You can pick an action by moving your finger in that direction (left, right, up or down). Selected parts can be moved directly. Touch handles appear near the edges of the editor when small items like notes or dots are selected, so you can move them easily. The duration of notes can be changed using a touch handle as well. You can scroll an editor horizontally using one finger. Scrolling vertically works too where applicable. With a multitouch screen you can zoom horizontally using two fingers as well. With a multi-touch screen the pianoroll, score and audio editors can be zoomed vertically using two fingers. While moving the start or end of a selected part you can zoom in by moving your finger down (to the bottom of the screen). The editor will zoom in until you release your finger again. You can use this feature to accurately set start/end points without having to actually zoom in and out again. 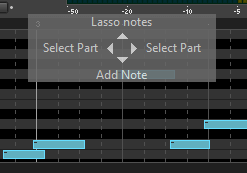 A copy of part of the editor appears above the editor while lassoing notes so you can see the part covered by your finger. There's a semi-transparent "touchthumb" on the editor itself which can be used to move the needle. The time line bar above the editor can't be used with touch. Doubletapping the touchthumb starts the transport, tap-and-drag starts cycling. The SEL ALL button is replaced with a SEL button which pops up a menu with various options to select a part, play it cycling or stretch it. If the main window shows a vertical scrollbar you can put a finger anywhere on any mixer section and move it vertically to move all mixer sections. Tap outside of the menu to close it. A tablet or a convertible notebook (which lets you flip the lid, so the screen is outside when the lid is closed) would be a nice computer to use. Another interesting option would be a touchscreen mounted on a stand, connected to your computer. It's best to have the screen sloped towards you. The best touch experience is provided by Windows 8 or newer, combined with a multi-touch screen. Multi-touch means you can use multiple fingers simultaneously. The onscreen MIDI keyboard benefits from this, and it allows for two-finger zooming. 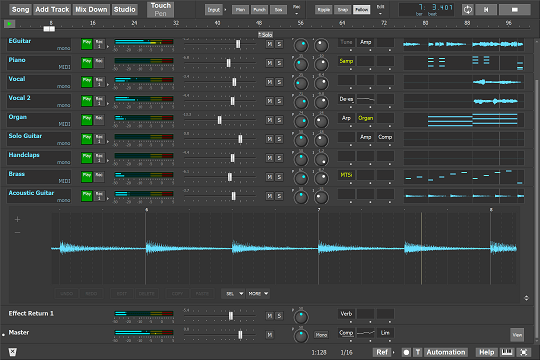 MultitrackStudio can be used with single-touch touchscreens or older Windows versions. Note that older monitors based on resistive technology require a significant amount of pressure applied by your finger. Such a monitor is not recommended because it makes it very hard to drag you finger over the screen, so controlling faders, knobs and editors etc. is very difficult. Collapsing mixer sections isn't possible. The buttons would get in the way and the collapsed sections would be too small. 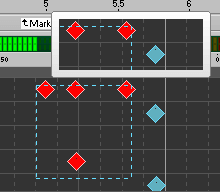 The editor's warp feature currently can't be used with touch.